Who: Heroes in the fight against cancer band together to “Pay It Forward Friday” to support the Heroes Foundation (heroesfoundation.org). Where: Flat12 Bierwerks, 414 N. Dorman St., Indianapolis. 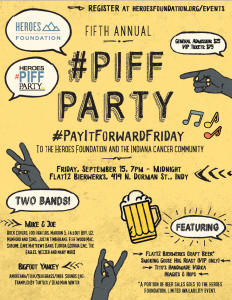 Why: All #PIFF Party proceeds benefit the Heroes Foundation and the Indianapolis-based non-profit organization’s work for the Indiana cancer community. The Heroes Foundation’s mission is to provide meaningful support to cancer patients, education to promote cancer prevention and resources to advance research for a cure. — Mike & Joe — Rock Covers: Foo Fighters, Maroon 5, Fallout Boy, U2, Mumford and Sons, Justin Timberlake, Fleetwood Mac, Sublime, Dave Matthews Band, Florida Georgia Line, The Eagles, Weezer and many more! — Bigfoot Yancey — Americana/Folk/Bluegrass/Indie. Sounds Like: Trampled By Turtles and Dead Man Winter.